For sports lovers in the city, January for over a decade meant the time of the Chennai Open. This tennis tournament, which brought some international stars to our city, began life as the McDowell Open in 1996 in New Delhi, it moved to Madras the next year as the Gold Flake Open. In 2002, it was renamed Tata Open and, then, in 2005 it became the Chennai Open, under which name it held its annual tournament here till 2017, moving thereafter to Pune. In a way even that is a lost landmark now, for it really put the city on the tennis circuit with the Sports Development Authority of Tamil Nadu’s tennis stadium in Nungambakkam. The stadium used to be filled up for the tournament, thereby reflecting the enthusiasm for the game in Chennai. But now it almost seems an empty shell. 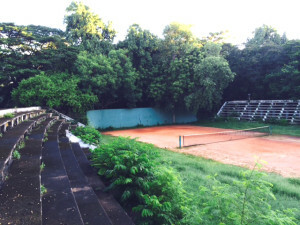 Sadder still, close by in Egmore, the first public tennis stadium of the city remained a picture of neglect. Now it has gone further to seed. Tennis has had a long history in Madras. The first private court outside of residences was laid at the Madras Cricket Club in 1883. Thereafter, other clubs followed suit. Women got theirs early in the 20th Century, with facilities in Queen Mary’s College, the Egmore Ladies Recreation Club and the Mylapore Ladies Club. The game received a fillip when Lord Willingdon became the Governor, in 1919. By the time he returned to England in 1924, there were enough clubs in the city for a Lawn Tennis Association to be formed. That came about in 1926. Tennis however remained a game to be played in the privacy of homes, colleges and clubs. It was in 1946 that the city acquired its first public tennis courts. This was entirely due to JPL Shenoy, then Commissioner of the Corporation of Madras. A member of the Indian Civil Service (ICS), Shenoy took over the position of Commissioner in 1944. He had earlier served in the same capacity in Madurai. In Madras, Shenoy began a number of path-breaking schemes – the straightening and shoring up of the Cooum banks, relaying most of the main roads, creating divisional offices of the Corporation in various parts of the city, celebrating Corporation Day every year and planning for vast areas to be developed as housing colonies. Assisting him in all of these was his ardent admirer, C Narasimham, who was Deputy Commissioner. The first of the housing colonies, which came up after Shenoy retired, was named after him and is present day Shenoy Nagar. A keen tennis player, Shenoy decided that the city needed a public tennis court. He chose the Egmore playground set up by the Corporation in 1928 as a suitable site. The military was roped in to complete the construction quickly. Under the supervision of Corporation ­Engineer M. Meeran, work on the stadium began on November 10, 1946 and was completed on December 30th the same year! The facility, with three tennis courts and concrete galleries that could seat around 1,000 people, was declared open on December 31, 1946 by the Gaekward of Baroda in the presence of the Mayor of Madras, T. Sundara Rao Naidu. The Madras (later Tamil Nadu) Lawn Tennis Association moved into the clubhouse that was built alongside. It was on these courts that the Davis Cup matches were played in the 1950s, all of them featuring the Madras-based international tennis legend R Krishnan. “Full-throated roar from the huge gathering at the Egmore Stadium in Madras (at) a grand match when a tall and lithe Australian, Roy Emerson by name, went down in the fifth set to the Indian genius, Ramanathan Krishnan” ran a caption in The Hindu’s Sport & Pastime in 1964. Apart from the Davis Cup, the stadium witnessed several other tennis matches as well. By the late 1960s, with crowds increasing, Davis Cup tournaments began to be held at a makeshift facility put up on the Island Grounds. The Egmore stadium continued to be used for training – this was where the Amritraj Brothers were taught the nuances by famed coach T.A. Rama Rao. The rear of the stadium was where football, hockey and volleyball were played. With the SDAT constructing the Nungambakkam facility, tennis moved away from here forever. A vast hockey stadium was constructed to the rear and named after former Mayor M Radhakrishna Pillai. It overshadows the old tennis stadium parts of which, along with the clubhouse have been taken over by the Tamil Nadu Volleyball Association. What is left could do with better maintenance as part of our sports heritage. A dense overgrowth hides much of the access to the tennis court. The cement stands are all chipped. The court, surprisingly, is well maintained. It is used as a walking track early in the morning by several locals of Egmore. Below a stand is a forlorn plaque. A close scrutiny reveals it to be the foundation stone – Shenoy’s dream come to life. The neglect of this facility is quite a mystery. Why can it not be restored and put to good use?